I started this last year with my daughter. I bought her an art journal and encouraged her to draw in it every day. On some days she draws something inspired by our studies and on other days she draws whatever inspires her. I always record the date and a “title” for her drawings in her art journal. Artist studies are a wonderful way to teach children about art. You don’t need to know a lot about the artist… use this opportunity to explore together! My daughter and I have done artist studies on Paul Klee and Maud Lewis. You can investigate our artist studies or feel free to create your own! Another resource is the Teachers Pay Teachers website. There are amazing curriculum packages and artist-specific ideas which can be purchased for a few dollars each! If you’re wanting to explore art techniques with your child, there are many books and videos available which teach different artistic processes. Local libraries and art galleries may also offer free or inexpensive lessons as well. It’s important to note that art doesn’t simply mean drawing and painting. There are many mediums of art to explore. Here are some of our favourites. If you’re looking for inspiration for drawing you can check out this article of creative ways to encourage drawing! Creative painting ideas can be found in this article about painting with young children. I use the notebooking site to construct a set of lessons or a study. With many of the pages, I set up lines for my daughter to write on and I include a box for her to draw in. I incorporate notebooking mostly into science because it’s a lovely way to document learning. Online art classes is one of my favourite ways to incorporate art into our homeschool curriculum. Alisha Gratehouse from Flourish teaches several different online art classes. Her programs offer everything from high quality videos to printable PDF study guides. It’s very affordable and provides many fabulous lessons and resources. Just visit Alisha’s website to check out all she offers! Art doesn’t have to be overwhelming or intimidating. There are many opportunities to learn about and explore art with your child. You don’t have to be an expert! Teachers Pay Teachers is such an awesome resource. I’ve been tapping into it more and more with homeschooling. I am one of those parents who would think that since I can’t even draw stick figures I wouldn’t even know where to start. This is a great guide. Remember I said I’m stalking your blog for every tip I can get since I plan on homeschooling Madison when she’s a bit older. I’ve started on the basics of colors, shapes and the alphabet but never thought of art. Art is such a great way to engage children’s minds. What are they thinking? What are they seeing? What do they like most? It’s a great conversation starter and it’s fun to experiment with different mediums and techniques! I love art because it can speak to you no matter the medium, the artist, the popularity, or any outside influence. It’s so important to expose children to as many different mediums, and I love your list! Sometimes it’s also great for me to get the reminder that just letting them explore something without instruction is a powerful way to learn, too. I let her peruse through our art books and tell me what she sees and feels before we talk about them together. Thanks again! Yes! Art is a wonderful way to provoke thoughts and discussions! Indeed, art can be explored without discussion – sometimes that’s the best instruction! We LOVE art…as you probably know. I will check out those books – I’m always looking for new ideas! We love art too. We’re creating all of the time. The books are fabulous Kristen! I love having a starting point when it comes to art and books are a fun way to do so. That’s so interesting! On this side of things, my mom is an art teacher and owns her own art school. She gives private lessons to homeschoolers a lot as part of their curriculum. So I guess people find really cool ways to learn art. I find it intimidating myself, despite my mom being one! It’s less intimidating than teaching math, though.. I love experimenting with art. It can be intimidating but I always remind myself that I’m creating for myself… not for anyone else. That seems to ease up the “pressure”. Hi Jennifer! I stink at art, but that doesn’t mean I don’t like it. I like the creative process, even if the results are not that impressive. The list of all the different mediums is a great way to test all the ways to create. I think the joy you get from creating trumps any judgement about the result. For me anyway! I love the creative process too… and it’s so important to give our children the opportunity to explore art in the ways which they like. 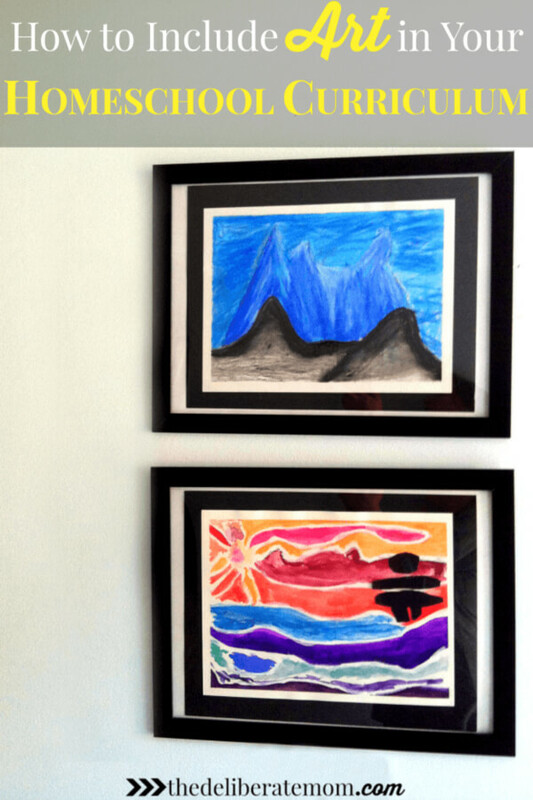 I loved the artwork my daughter created… she worked really hard on them too. How cool is that soapstone carving kit! I am always looking for fun summer activities to keep us learning and having fun when the temperatures rise outside! I like your field trip idea! You can learn so much that way! Last summer we went to several farmers markets where we could talk to artists and learn about their work. Isn’t the soapstone carving kit the coolest?! I love the way it looks in the end too! Farmers markets and art shows are wonderful ways for children to see artists at work. We definitely need more art in our homeschool day! We used to do simple art projects when they were younger, but now that they’re teenagers, it is much more difficult. We’ve tried studying the classics and one of my boys likes to draw, but we should do more of the extra activities. I especially like the different medium ideas! Thank you for the great ideas!! I imagine it would get a bit more challenging as they get older. I confess, I have this really cheesy vision of one day discussing art classics with my girls! That would be awesome. I would think that art journals would be a great idea for teens. Draw, collage, whatever they like can be put into it. Depending on the age of the children homeschooled, they could probably go on a field trip to a university and shadow an art student or professor. Or, as you mention with field trips, small art galleries often have cheap and manageable events or programs that might be great for a supplemental learning opportunity. It’s so wonderful to see art in action and to have the opportunity to meet “real” artists! I love your idea of making connections at the university – great tip! An art journal is a great idea! You are so blessed to have an artistic nanny who loves doing those sorts of things with Little A. That’s awesome! We love our art journals. I’m thinking that this year, I may keep an art journal and create daily in mine too. For me, art has been accidental. My kids are all very expressive with their art, but I tend to lack either the inspiration or the patience to allow projects to happen often enough.I love the idea of focusing on art through the summer. I fell in love with note booking as well, and think this would be a great way to focus on an artist or medium. Isn’t Notebooking awesome? I just love how organic it is. We’re constantly creating – and I try to make the focus more about the process than the final product. Thanks for sharing your thoughts on how to include art in your homeschool curriculum. Love the idea of an art journal – great post Jennifer! !